on social media this week titled “Dear Moms, Jesus Wants You to Chill Out.” It is a great post, reminding moms that the yoke of legalism is a heavy burden to bear, and that majoring in the minors does nothing to help us love God, our spouses or our children better. I applaud Altrogge’s insight into the comparison-plagued mind of the typical Christian mom, daily sailing between the Scylla-and-Charybdis scenarios of motherhood (doctor or doula? Bottle or breast? Gluttony or gluten-free? Public or private? And on we sail…) Modern moms are so often characterized by (and crushed by) the side-long glance of comparison. In matters of legalism, rest – yes – but in matters of holiness, run. Run like your hair is on fire. Cast off everything that hinders: all false measures of righteousness cloaked as homemade bread or spotless kitchen surfaces. But let your newly-found chill mentality toward Pinterest and June Cleaver free up energy to run the race that counts. Because this good work of loving God and loving others is a race for the fit and the fleet, particularly if you’re a mom. Psychologists tell us that a child’s moral framework – the way they view right and wrong – begins forming at eighteen months and is set by around age eleven. So if you thought you had eighteen years to train them in the fear and admonition of the Lord, you might want to bump up your timetable. You might want to run. In the faith-fueled race of holiness, some days you will run well and some days you will run out of steam. There is grace for that, and majoring in the majors will require you to draw on it constantly. But get up and run again. Your family does not need you to bake the perfect pie, but they do need you to run with endurance the race marked out for you—a race that we run for the joy set before us: the joy of running in the very steps of Christ. Not an easy race, no, but a course we can surely complete because of the completed work of the cross. 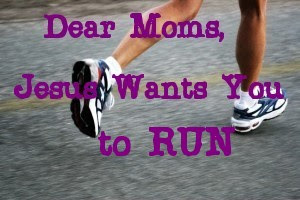 Dear moms, Jesus wants you to run. Love how the opposite of gluten-free is gluttony….